Plan Curtail addresses the complexity of the ways we use energy. Every part of our lives must be considered if we are to reduce CO2 emissions. The individual parts that make up Goods and Services may each be small, but when added together they are significant. For example, people who build a super energy-efficient house find that smaller energy consuming products in their homes, such as big screen TVs, show up as the next large user of electricity. John Morgan uses watt meters to measure and manage his energy use (read his story under Friends and Curtailers below). Linda Wigington, founder of the 1000 Home Challenge, focuses on lifestyle changes, building improvements, and use of various technologies such as ductless mini-split heaters for achieving deep reductions in actual building energy use. She also recommends new refrigerators that use no more than one (1) kilowatt hour per day. Both John and Linda practice energy austerity in their daily living. Goods and Services include a wide variety of sub-categories (shown below) such as appliances, electronics, clothing and health care. 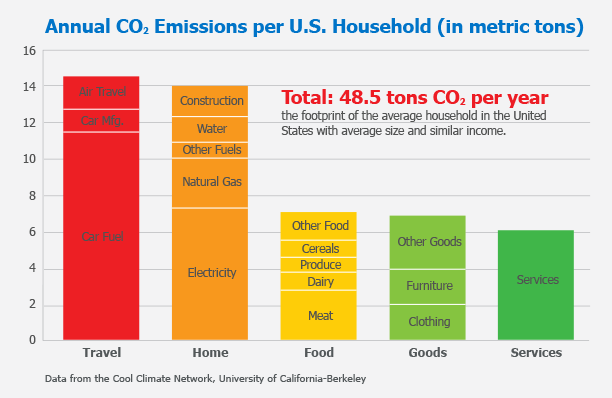 To create a CO2 budget requires allocating estimates to these categories. 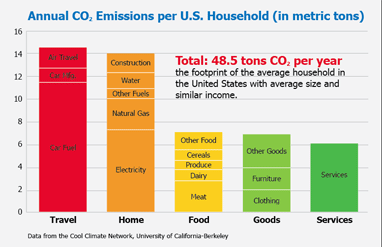 The importance of Goods and Services is described in the article, “Creating a CO2 Budget: A Necessary Step to Cutting CO2 Emissions,” to the right of this page. You can also find a sampling of CO2 Calculators that other people and organizations have developed. Scroll to the right to view all. Plan Curtail focuses on personal responsibility for reducing each person’s annual CO2 emissions as the most important factor in combatting climate change. Since the U.S. is the largest generator of CO2 on a per capita basis (16.2 metric tons per person per year), it is the most important country for curtailment analysis and planning. This paper begins with a short review of the world situation, moves to a national perspective, and then to the household level, ending with Goods and Services.